My compliments about the bike! It totally met my expectations. Lightweight frame, new Ultegra and good wheels and tyres. I enjoyed the bike very much. 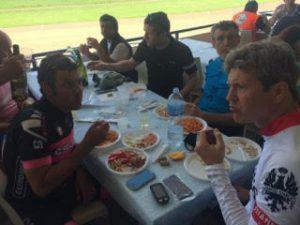 In total I rode about 250 km in the chianti, and in the areas west and south of Siena. It is beautiful there! I’ll just make sure I have a few more hills in my legs before I arrive in Tuscany! I’ve certainly got them now. We had such a wonderful day with Massimo, exceeding all our expectations. The ride was great and we even learned some Italian! We will highly recommend Gusto to anyone we know coming to Tuscany and I’m happy to write a good review on TripAdvisor if you want. I wanted to let you know that Amber and I had a great day with Stefano. He was a very nice and knowledgable guide and we enjoyed him showing us the sites (and hills) in the countryside. It was a hot day for us, but we enjoyed the whole trip. Very good thanks! Great bike. I enjoyed cycling in the area. Will be back next year! We want to thank you for the excellent service and perfect bikes you rented us! 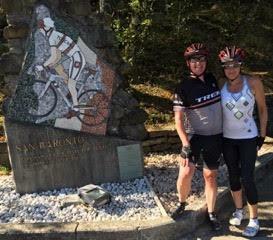 Marco, I would like to thank you for arranging an excellent cycling holiday for me and my group of cycling friends. All of the arrangements worked perfectly. The accommodation – staying first in Andrea’s B&B in the countryside outside of Siena and then in the hotel in the bustling Montecatini Terme – worked out really well and provided a nice contrast. As well as being a thoroughly nice man, Andrea is an excellent guide; the best in Tuscany. 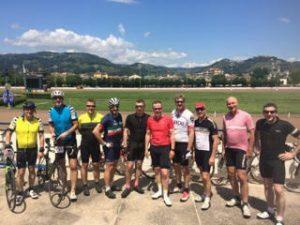 Yours idea to enter the Gran Fondo Montecatini was inspired as was the suggestion to take the Funicolare di Montecatini Terme and to have our last night dinner in Montecatini Alto. On behalf of the whole group thank you very much. 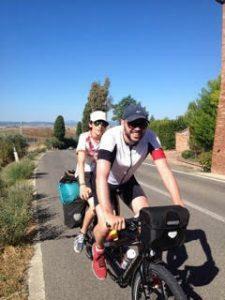 “I would highly recommend Gusto Cycling. The delivery specialist was very professional and got us outfitted properly on high-quality road bikes in new condition right at our villa – it couldn’t have been any easier! 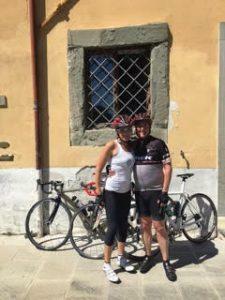 We really enjoyed riding through the Tuscan countryside and will definitely rent again next time we’re in the area. The overall experience was excellent. It was great. Stefano took me on a great route through Camaiore and Lucca plus a trip to the home of Puccini with coffee and drinks along the way. The distance and climbing were right and we covered about 100km. Thanks for putting me in touch with Stefano. 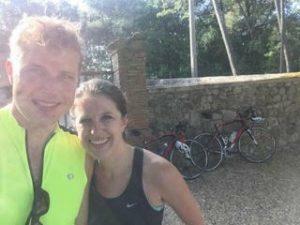 We had a fantastic (allbeit challenging) day cycling around Montecatini Terme! 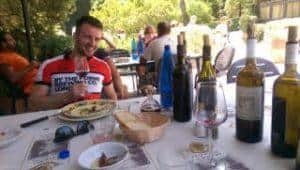 We cycled up to Marliana and Goraiolo before decending down into Pescia and then to Montecarlo where we stopped at the Fattoria Il Poggio for lunch. The whole trip was very beautiful. I must thank you and your friendly team who were very helpful when we arrived. The bikes were great, the staff took time to get the setup correct for both me and my wife and importantly I got to practice my Italian as no one spoke English! All round very good service and I will certainly recommend. 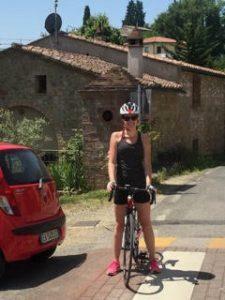 The bike was really good and the riding in Tuscany was excellent. Bike was fine. 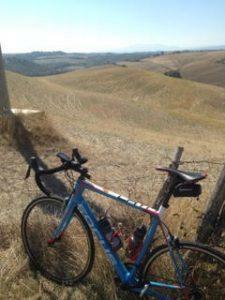 Tuscany beautiful – really enjoyed my cycling. It was very good. Good bike and great delivery service. I would rate your service as very good. Despite the fact that the original bike had the issue of the bolt to adjust the seat height, your response was immediate. The second bike you provided was a very good bike. The tune up was perfect and additionally the setup of the gears 53/28 or 53/30 (I cant recall) was perfectly suited for the terrain of Tuscany. Very good service. The delivery was on time as it was promised. The pickup was also on time and the person sent was very kind and helpful. Additionally your price is much better than the competition. Many thanks for your help in organising the below for us. We had 5 days of glorious cycling. Thanks the bikes were superb! Your service was great; fast response to our e-mails, the bikes were just like you told us they would be (sizes, including the rack etc). 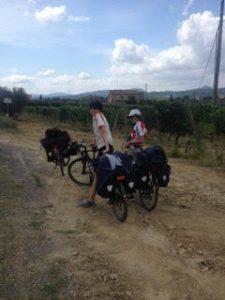 We would defenitely like to thank you for enabeling us to explore Tuscany by bike! Outstanding!! Great equipment and the service is phenomenal. 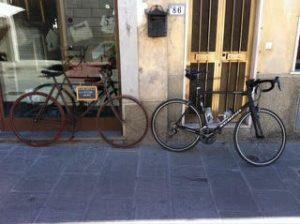 Thanks so much for arranging my cycle hire when I was in Tuscany. The ability to provide different bikes for the different terrains of the Strade Bianche and the rolling hills was a real bonus allowing me to get the most out of my training. I found the staff to be helpful and knowledgeable even thought the shop was quiet busy. The bikes themselves were in good condition and well maintained. Hello Marco, yes we were very pleased with the bikes and the service provided by Stefano – thank you for recommending him. Bye the way, Richard and friends managed their 102 km and I managed my 27 km which was a great achievement for me! Very happy with your service and very happy with the bike. I have kept your contact details and will definitely be in touch if I’m in tusacny again cycling. Both service and bike were very good! Staff was very friendly and helpful, bike was almost new and very handy. 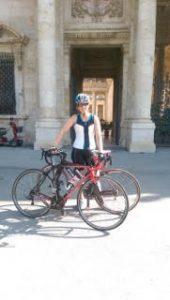 Attached is a photo of my bike (rented from you:)) that was taken during my cycling tour not far from Montecarlo. Hope I will come back! We had a nice week even the weather was a bit cold and rainy. But that was no problem for us Scandinavians ;-). Monday we even biked to Abetone in 2 degrees and snow on the top. 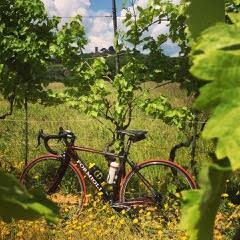 All in all, Tuscany is a beautiful place to bike even the tough weather. Yes very happy with how proactive and ‘human’ you were in us getting it all together. Massimo was brilliant – best driver we’ve had I think. Responsive, passionate with a good sense of humour. Very considerate in ensuring no one was left behind and checking instructions with me from time to time. All in all, top marks – so thanks again. 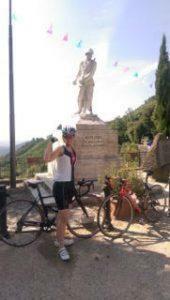 I had a great ride in the Montecatini – Pistoia area. 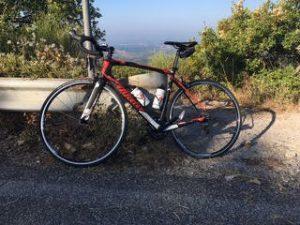 Bike rented was a brand new carbon Formiglia with Campagolo Potenza group. Thanks for your help in arranging my bike hire. Great experience all round. Loved the bikes at first sight, really beautiful machines. The guys in the shop were super friendly and helpful as well. We did a short ride around the Deici Castelli near Pescia the first day and then my son and I went for a longer ride further North the day after. Both good rides but the second was both of our favourite rides ever. Fabulous countryside and empty roads with mostly great surfaces. Very sad to hand the bikes back and would love to do it again. Thank you again Marco for facilitating a really great experience.